Creamy cheesecake layered between chocolate chip cookie bars. Preheat oven to 350 degrees F. Line an 8 inch square metal pan with nonstick foil or line with regular foil and grease it. In a large mixing bowl, beat the butter until creamy. Beat in both sugars, vanilla, salt and baking soda and continue beating until well mixed, scraping sides of bowl occasionally. Beat in the egg. Add the flour and stir by hand until mixture is well blended. Stir in the chocolate chips. Empty mixture onto a flat surface and shape into a log. Cut off about ¼ of the log and save for future cookies. Cut remaining log in half and press half into the bottom of the lined pan. Prepare filling. Beat the cream cheese and sugar until smooth, then beat in the vanilla and the egg. When smooth, stir in the chocolate chips. 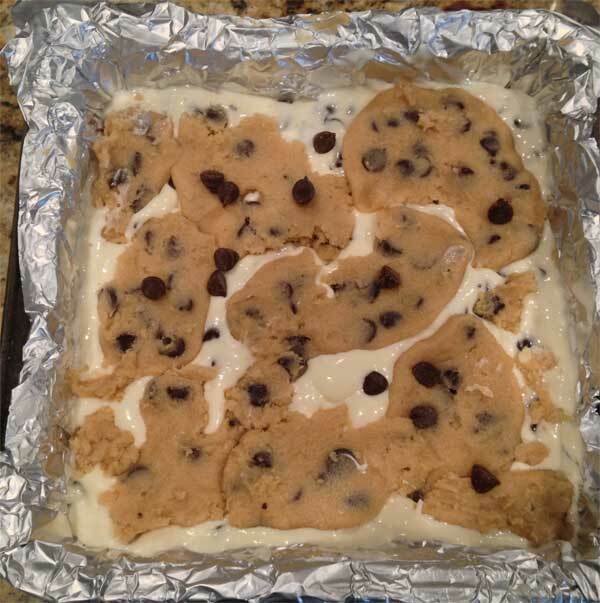 Pour this mixture over the chocolate chip cookie dough base. Break off very large marble size pieces of remaining dough and flatten. Lay the pieces over the cream cheese mixture, spreading evenly, until you’ve used all the dough. Cream cheese mixture will not be completely covered. Bake on the rack just below the center of the oven for 30 minutes or until golden. The bars will puff up quite a bit, but will sink somewhat as they cool. Let cool completely, then chill for at least 3 hours. Lift from pan and cut into squares. Alternatively, you may substitute a 16 oz package of refrigerated cookie dough.